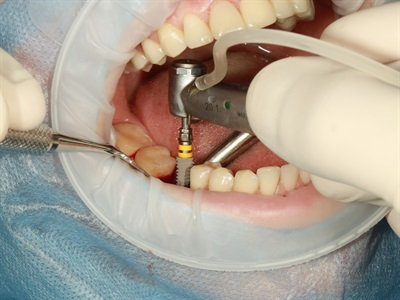 A greater variety of products are entering the dental implant market, competition is increasing and fewer customers are seeking specific premium brands. While commoditization is generally beneficial for customers looking to pay less, it means that the markets experience limitations that reduce growth potential. However, despite this trend, the U.S. dental implant and final abutment market is projected to experience growth in the range of 5% per year. Even though discount pricing and product bundling have limited revenue, this sustained growth is a result of shifting patient and dentist preferences and increased awareness of dental implant restorations. 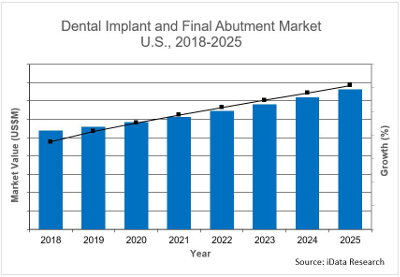 The U.S. dental implant and final abutment market is poised to experience mid-single-digit growth through 2025, reaching over $1.5 billion, as reported in a recent study by iData Research. This analysis includes the markets for dental implants, final abutments, instrument kits, treatment planning software and surgical guides. These markets are growing in response to increased demand from dentists, particularly general practitioners (GPs), who are placing implants in greater numbers. Consumer awareness of implant-supported restorations is also growing, due to nationwide marketing and positive patient outcomes. Conversely, the proliferation of low-cost competitors and general competitive pressure are factors limiting market growth. The established premium implant brands are facing increased competition from their low-cost counterparts. The increasing volume of GPs placing implants has prompted shifts in dentist purchasing patterns, such as less brand loyalty and more price sensitivity. Therefore, implants priced in the value (mid-level) and discount (most affordable) ranges are attracting new customers, who are less likely to be able to differentiate between the numerous brands currently on the market. Many popular discount competitors originate from South Korea, Argentina, Brazil and Israel. More on the dental implant fixtures and final abutments market in the U.S. can be found in a series of reports published by iData entitled the U.S. Market Report Suite for Dental Implant Fixtures and Final Abutments. This report covers the following market segments: dental implant fixtures, final abutments, dental implant instrument kits, treatment planning software and surgical guides. The iData series on the market for dental implant fixtures and final abutments covers the U.S., Latin America (Brazil, Mexico, Argentina) and 15 countries in Europe including Germany, France, the United Kingdom (U.K.), Italy, Spain, Benelux (Belgium, Netherlands and Luxemburg), Scandinavia (Finland, Denmark, Sweden and Norway), Portugal, Austria and Switzerland. Reports provide a comprehensive analysis including units sold, procedure numbers, market value, forecasts, as well as detailed competitive market shares and analysis of major players’ success strategies in each market and segment. To find out more about dental implant fixtures and final abutments market data or procedure data, register online or email us at [email protected] for a U.S. Market Report Suite for Dental Implant Fixtures and Final Abutments brochure and synopsis.